Beyer Studio often gets requests for small stained glass windows for small or private chapels. We are now offering this 32” diameter stained glass window of the Holy Spirit and symbols of the Four Evangelists. This window is built new when ordered and is available as a stand alone stained glass panel for $7,960. This stained glass window can also be purchased as a package which includes an aluminum frame designed to hold stained glass and a one-inch insulated, exterior glass unit panel. The stained glass window with frame and insulated glass unit is $9,120. 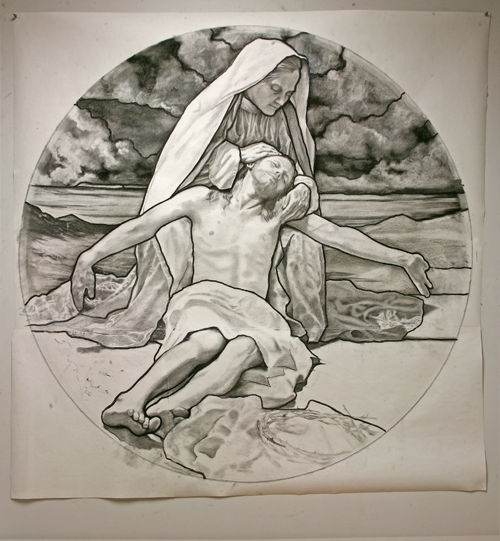 The stained glass window, for which this drawing is a figure study, was made here at the studio in 2010. For years we have been posing coworkers in the attitudes of Angels and Saints to illuminate the details of a particular gesture. In this case, I began the design process with a long posing session with live models dressed as they appear in the design. While the lighting and poses were staged in-doors, I used Photoshop to relocate the figures into a southwest landscape to heighten the sense of desertion and isolation. Using digital photography affords the opportunity to compare numerous poses side-by-side in real time, but the most interesting reason for invoking the photographic aspect is our collective acceptance of photography as reality. The ubiquitous and ever-present influence of the photographic look has made an impression on all of us, changing the way we see the world, for better or for worse. It would have been possible to draw this pose from direct observation but capturing the image with a lens imposes a “look” that modern eyes accept as “real”. There are some changes between this preliminary drawing and the finished window, primarily in the sky, which I made less dramatic so as not to divert attention from the figures. The crown of thorns with the rose bloom was a specific request of Father Fitzpatrick, the Pastor of Saint Peters. The friendship we shared and his willingness to risk doing something different made this window, and this drawing, possible. Reproduction of German made tracery. Historic stained glass windows offer Beyer Studio artists a rich educational resource for learning the craft of stained glass. Many windows found in American churches from the late 19th and early 20th centuries were designed and crafted in Europe. This decorative rose panel is a reproduction by our studio artists based on a quatrefoil tracery section made by Franz Mayer and Co. of Munich, Germany in 1889. Measuring 28 inches in diameter, this panel celebrates the elaborate and prolific organic decoration that is characteristic of neo-Gothic German windows. The lily forms were traced and painted with vitreous glass paint, kiln-fired to fuse the paint to the glass and then embellished with silver nitrate stain which when kiln-fired produces the gold color seen in the stamens. 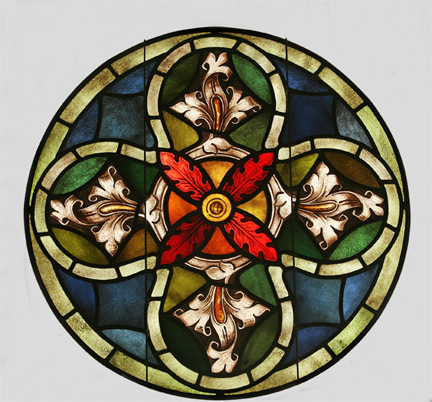 Following the many centuries of the legacy of stained glass, the panel was assembled with extruded lead cames, soldered, weatherproofed and reinforced with steel bars. Initially a decorative tracery element above a Gothic-style narrative religious window, the inspirational quatrefoil shape with lilies would have also embellished the pictorial window through symbolism. The reproduction panel as well can still reference religious symbolism for us; and yet, independent of the context of a sacred setting, the floral and symmetrical pattern exists equally well in a formal, secular aesthetic. The reinforcing bars on this panel have holes drilled into the ends for hanging as an autonomous panel but could also be installed architecturally. The panel is made to order. The cost is $1,500 plus shipping. Pennsylvania residents will be charged appropriate sales tax. For further information, call Beyer Studio at 215-848-3502 or e-mail at sales@beyerstudio.com. See this panel being made.